BabyBarista may have won the battle for tenancy, but the war has just begun. In his pupilage year, BabyBarista learned the hard way that dirty tricks and a faulty moral compass are essential items in a young lawyer’s briefcase. Now, as the newest tenant in chambers, he must face down old enemies, try to win compensation for a group of ASBO-attracting pensioners, and unravel the complicated knots of his love life – not to mention his mother’s finances. Under the wise and watchful eye of OldRuin, BabyBarista tries to keep his nose (and his wig) clean, but when SlipperySlope, an unscrupulous solicitor offers him a quick way out of his financial difficulties he soon becomes embroiled in blackmail, dodgy share-dealing and the dark arts of litigation. With his old adversary, TopFirst out for revenge, and the chance to be awarded a coveted ‘red bag’ at stake, BabyB must use all the tricks of his trade to extricate himself from his legal quagmire, win the case for his mad old clients, and somehow convince his best friend to fall in love with him. Chronicling the hilarious and sometimes almost unbelievable absurdities of the modern bar, and peopled by a cast of unforgettable characters, “Law and Peace” is a funny, fast-paced Machiavellian romp through the legal world. 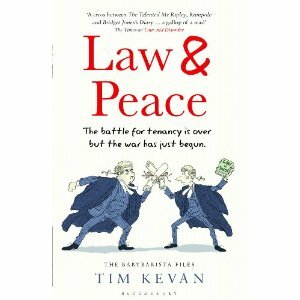 Tim Kevan is a barrister and writer. As well as writing the BabyBarista blog first for The Times and now for the Guardian, he practised as a barrister in London for ten years, during which time he wrote or co-wrote ten law books and was a regular legal pundit for television and radio. He is also the co-author, with Dr Michelle Tempest, of Why Lawyers Should Surf. He now lives by the sea in Braunton in North Devon, goes surfing at the merest hint of swell and is a co-founder of two businesses which provide online legal training and publishing respectively: CPD Webinars and Law Brief Publishing. Brought up in Minehead in Somerset, he was educated at Cambridge and was a scholar of the Middle Temple. All the best on the new book Tim and thank you for adding me to your blogroll. This has been reciprocated.